Our thanks to Rick Nasoff, who submitted his original 1.75 ips quarter-track reel recording of Casey Kasem on WPIX-FM from July 4, 1976. This is a portion of the Bicentennial Special, which was also the sixth anniversary of the original syndication of American Top 40.
. . . We're wavin' the Star Spangled Banner for the Two-Hundredth Birthday of the U.S.A. . . .
1969 Love Theme From "Romeo and Juliet"
American Top 40 was celebrating six years airtime on July 4, 1976, when the United States was celebrating the Big 200. 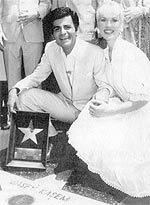 The American Top 40 Bicentennial Special featured the Number One Songs on July 4th from 1937 through 1976. Sprinkled with fascinating facts, presented as only Countdown Master Kasem can present them, we offer a partial retrospective on the 25th anniversary of this historic program for July 4, 2001. Our exhibit includes the program as presented on WPIX-FM in New York, but only for the years 1937 through 1959. As Rob Durkee notes in American Top 40: The Countdown of the Century, AT40 specials weren't exempt from goofs. This special features a mistake with the second song; Says My Heart is actually a song called Whoa Baby, on which Harriet Hilliard is not heard. Simply, they played the wrong song. There were no Billboard charts from 1937-1939, so the first two titles were based on the reports of other trade publications. No artist is featured more than once in this countdown. This aircheck includes an authentic, Sunday morning WPIX-FM newscast (at 24:23), complete with street closures for the Bicentennial celebrations that day. And, there is a great spot for Nathan's Famous. As of July 4, 2004, Part Two of this feature is available in The Dale Patterson Collection.